Ask the children if they know the names of any of the Hindu deities. Can they name, for example, Shiva, Vishnu, Krishna, Ganesha, Rama, Lakshmi, Saraswati, Durga, Brahma? Put up some pictures of some of these deities, e.g., from Google Images, and help children to identify them. Explain that, for most Hindus, ‘God’ or ‘Deity’ is in everyone and everything. That is why, for example, a common greeting amongst Hindus is ‘Namaste’, meaning, ‘I salute the deity within you’. But some beings are believed to be ‘avatars of God’, that is, beings such as Krishna, Lord Ram, Lakshmi, Ganesha, and so on, are appearances of God, in forms we can recognise. Many stories are told about these deities. And some of these are believed to tell people something about the way to live a better life. If people learn from such stories they may make ‘spiritual’ progress. Ask the children for their ideas about ‘spiritual progress’ – what might this mean? Get some reflections and point out that as well as mystical beliefs about the soul being united with God or going to heaven after death, there are also beliefs about the development of the human personality, in the here and now. Whatever people believe, progress of this sort usually involves great effort and discipline, and today’s story can be seen in that light. Tell the story of how Durga vanquished the Demon from the REonline resource at http://www.reonline.org.uk/what-do-we-and-hindus-think-about-the-meaning-purpose-and-gender-of-power/ and engage the children in a P4C activity based on the story. See, e.g., https://p4c.com/about-p4c/teachers-guide/. Provide small groups of children with some sticky notes and a sheet of A3 paper with picture of Durga in the middle. Ask them to think about the story of how Durga defeated the demon and to write down one question each about what more they would like to know. They should stick their question around the picture. In their groups, they can then select one question, putting the rest of the questions to one side for now. Help pupils to modify the question if necessary, so that the question is an ‘open’ one with no ‘easy answer’. Encourage one pupil from each group to read out their chosen question, then ask the class to select one main question, which will be investigated in the rest of the session. Tweak the question if necessary to make it more open / philosophical. The rest of the questions can go into a ‘We Were Wondering…’ box, to be answered by pupils as an extension activity. When the children have decided their question, issue them with two tokens / cards, indicating the maximum number of contributions to the discussion that can be made. Steer the enquiry around the main question, building towards better understanding of the issue(s) being raised by the pupils. [In a large class, invite the question generators to make some summary comments about what has been said, indicating, with respect, where they agree or disagree.] Invite a few more comments from those who have not said anything, or much, up to this point. During the enquiry, encourage the children to identify some important features of religion and belief, to reflect on what these features might mean and to apply their reflections to their own lives. Encourage them to do their own research, perhaps from the remaining ‘We were wondering…’ box, and find out as much as they can about one Hindu god and one Hindu goddess. At Navratri, all the female deities are worshipped, with Durga being worshipped for the first three nights. Some Hindus give Durga special importance for the entire nine nights because of the story of her destroying the demon Mahishasura and his army to protect heaven. The story is a symbol of her power to destroy the bad within each of us, and her encouragement to us all to stand up for what is right. There was once a mighty shape-shifting demon called Mahishasura. He could take on many forms including animals. This was not enough for Mahishasura. He wanted to be the strongest and most feared of all the demons, so he pretended to be the God’s most dedicated worshipper. He prayed day and night, he fasted, he did yoga, he went on pilgrimages to holy places – anything to show Brahma (God) how devoted he was. Finally, Brahma appeared and asked what he wanted. “I want to be invincible! So no man will be able to harm me.” Brahma granted his wish. Mahishasura immediately gave up his life of devotion to Brahma. He set about capturing the towns and cities of India. Brahma’s gift kept him safe, no matter how violent and bloody the battle, Mahishasura always emerged from it completely unscathed. Stories were told of the mighty demon that no man could defeat, and so more and more demons joined his army until the empire of Mahishasura spread across the whole Earth. But that still wasn’t enough for Mahishasura, and he decided to lead his demon forces against Heaven itself. The Gods were taken completely by surprise and were no match for Mahishasura. They re-grouped in the mountains and consulted with the three High Gods: Brahma the Creator, Vishnu the Sustainer and Shiva the Regenerator. They discussed the problem of how to defeat a demon that Brahma had stated that no man could harm. 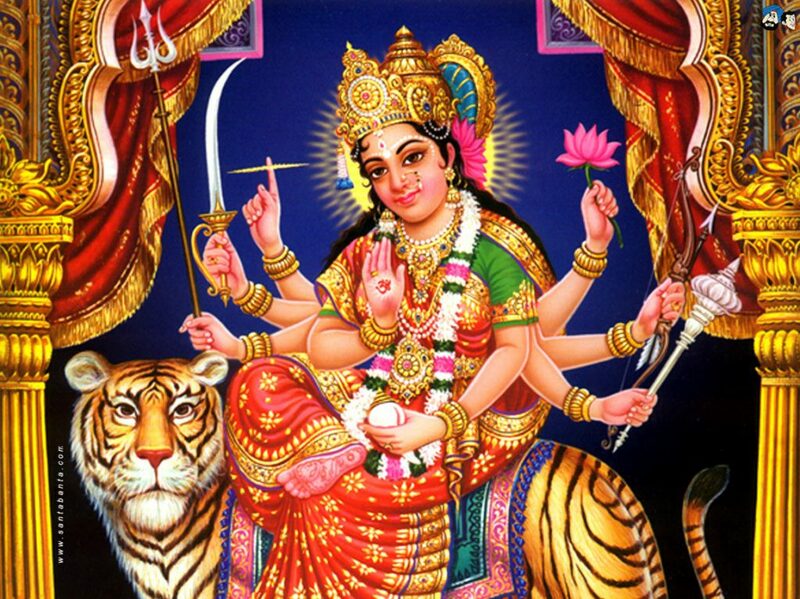 Brahma, Vishnu and Shiva combined their energies (Shakti) and from that explosion emerged Durga, the Warrior Goddess. She was beautiful and awesomely powerful. She had ten arms and held ten weapons, among them Vishnu’s mace and discus, Shiva’s trident, Indra’s thunderbolts, Vayu’s bow and arrows, Viswakarma’s axe and Agni’s fire. Finally, Himalaya gave her a magnificent lion to ride on. Durga saw what was happening and closed her eyes and frowned in deep concentration. Suddenly she began to transform. Her skin darkened, her teeth grew longer and sharper and her muscles grew larger and firmer. She changed to her even fiercer form, Kali. She fell upon Raktabija and holding him tightly, bit deeply into his neck, draining him of blood. When his dead body slumped to the ground not a drop of blood was spilled to form new clones. Kali’s powers grew with the demon blood coursing through her veins and with lightning speed she ran across the battlefield, felling demons all around her, and whenever she found one of Raktabija’s brood, she drank its blood. She grew stronger and stronger and fought harder and harder until the whole demon army lay dead at her feet. She danced with victory. As the blood cooled in her veins, she transformed back into the graceful Durga. She climbed onto her lion’s back and surveyed the battlefield. Only Mahishasura remained. Furiously he shape-shifted into a buffalo and charged towards Durga. As it thundered past, Durga plunged her sword deeply into the thick hide. The buffalo shape-shifted into an elephant that grabbed her lion. She hacked at the elephant’s trunk with an axe until it released her lion. The elephant staggered away, badly injured, but the demon still had enough power to shape-shift and became another lion. The two big cats reared up to fight with teeth and claws, but Durga’s mount was far stronger. Mahishasura shape-shifted back into human form and faced Durga, brandishing a huge sword. Durga laughed and advanced with her ten weapons held high. Mahishasura panicked. He had no chance against Durga in his human shape, so began to shift back into a buffalo. He was only halfway through the transformation when Durga leapt on him, pinning him down with her trident. With one stroke, she cut off the creature’s head. After nine long days, the battle was over and Mahishasura’s reign of terror was at an end. Good had finally defeated evil. [Note: In the ancient Sanskrit text there are detailed descriptions of the many forms the demon took and the nine forms Durga manifested to dual with him. In this story, we only cover one, Kali, by way of illustration].